Some reality stars are just reality stars. Kim Kimble was a star hairstylist long before her WeTV show L.A. Hair debuted in 2012, and she’s still one today. Her receipts run deep: Yes, she’s even slayed Queen Bey. Multiple times. On tour. Lemonade. Going way back to Austin Powers in Goldmember. 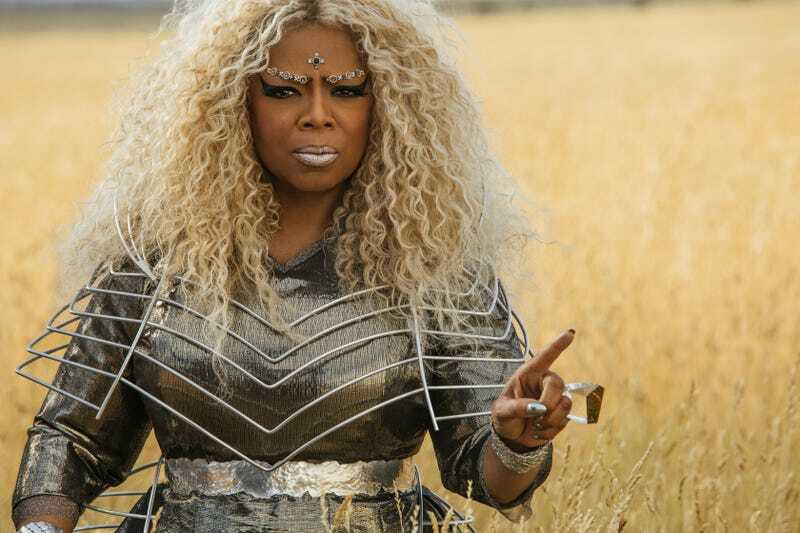 And those bold, blond tresses on Oprah for the Ava DuVernay-directed A Wrinkle in Time? Those are the extra-platinum receipts. Like the hair boss she is, Kimble was in charge of all the unbeweaveable action in AWIT. Yep, That’s Mindy Kaling, Reese Witherspoon, Gugu Mbatha-Raw, Storm Reid and the whole shebang. In the Disney big-screen adaptation of Madeleine L’Engle’s classic 1962 novel, a girl named Meg Murry, along with adopted brother Charles Wallace and friend Calvin O’Keefe, sets out to find her scientist dad aided by celestial aides, but Hollywood and Kim Kimble found each other much more easily. Kimble got her first film break creating hairstyles for the zany 1997 film B*A*P*S. And in a glimpse of things to come, her outrageous hair flair even landed the Chicago-born, Los Angeles-made hair artist on what else? The Oprah Winfrey Show! How could the hair star not be all in? And when The Glow Up caught up with Kimble in Atlanta last month, as she was closing out appearances at the Bronner Bros. International Beauty Show (which we casually know as a “hair show”—shoutout to Chris Rock’s Good Hair), she dished all things hair and AWIT. I used to do a lot of fantasy hair competitions, and [director] Robert Townsend picked hairstyles I had done before in shows [for B*A*P*S]. [For Wrinkle], I had to be more creative, and I had to really search more on what to do with the hair because I really didn’t have anything to reference other than the book, and these were women from the universe. And what does a woman from the universe look like? There’s no real reference to that, but it was fun creating that. So I wanted something and Ava [also] wanted something that was more avant-garde, but something that was also kind of couture but very fashionable. I had to do a couple of meetings with Ava. That gave me ideas of how far she wanted to go with the look, and basically coming up with the color for each person. We went through, I want to say, 200 tear sheets of just ideas, and then it was very difficult to narrow down which looks, but we had to collaborate with the clothes and makeup. We had to all kind of work together to create the image of what this was going to look like because we didn’t want the hair competing with the clothes, and it needed to be cohesive and go together. It took a while for the clothes to really come together, so we put some ideas out there. Then, once I got to see the clothes, I pulled from the ideas that I thought would work best with the clothes. And then we did camera tests. So we got to actually see the clothes and the hair and the makeup altogether. Kim Kimble (right) touches up star Storm Reid (second right) as director Ava DuVernay (left) and crew members look on. To me, I call her “the diva of the universe.” Her clothes are metallic. Her hair color was metallic. We blended like platinum, gold and a little bit of bronze ... we custom-made all her hair. She was like, “I don’t want my ordinary color. I want something really different.” Out of all the colors, this one was, to me, the most striking, and it was very soft and beautiful on her. And then, of course, her hair was big and in textures, so we did a lot of curls and big hair. She had like a long braid at one point. So I just look at her like she’s the diva of the universe and her hair is made up of minerals of the earth. That’s why platinum, gold and bronze and those things blended together made up her hair. Her hair color didn’t really change, but what was different about her is that she had a lot of texture going on. She had little braids. Her thing was more cultural. So she was all these different cultures. Like Asian, African, Spanish, Indian; all these different cultures kind of made up Mrs. Who. If you look at her clothes, she’s like a quilt of just everything, and that was sort of the idea behind her image and her look. If you noticed, she had a lot of braided stuff and sculpted hairstyles. She was more earthy but, yet, a little fiery. She was a bit more whimsical and kind of quirky, in a way. She’s almost like a flower child with a little fire, I guess. Red was something I thought was very different for Reese. ... We really wanted to create this whole other image. I didn’t want you to look at her and see Reese. I wanted you to look at her and see a different person. The same thing with Oprah and Mindy. You wanted to see, like, a completely different person. I think it’s good for young girls to be able to look up to someone and to see this young African-American woman starring in a big film having natural hair. It’s going to be great for young women to identify. Even though I do feel like this newer generation is understanding more about natural hair and embracing it more, it’s great to see that on the big screen. Because for years, you had to have straight hair to be on TV. Natural hair wasn’t accepted. There was so much women power on this movie. [You had] Ava directing this big film and you got Mindy, Oprah and Reese. They’re acting in this movie, but Oprah has her own network and she’s got several films she’s produced. Reese produced Big Little Lies and then Mindy producing her own shows. These women are powerhouses. Being able to work around these women, I loved that energy! It was just powerhouses of women throughout the whole project. The Glow Up tip: We know you love to support black films, so let’s show Hollywood that they count. A Wrinkle in Time opens in theaters today, Friday, March 9!